Hi we will now be open between the 6th to the 22nd April then reopening on the 3rd to the 6th May and then from the 25th May onwards for the Summer to September. To find Beach, Surf and SUP hire click on the tabs above. 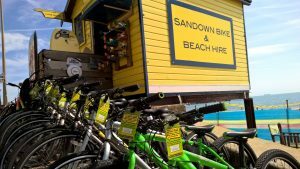 We are situated on the Red Squirrel cycle trail in Sandown on the Isle of Wight. 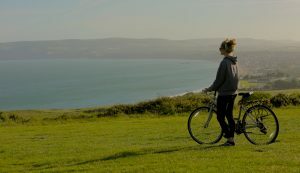 We are one of the most accessible places for bike hire on the Island as we are situated 5 minutes from the Island Line train which connects to Portsmouth and then onto London Waterloo. We have a selection of ladies and gents bikes, kids bikes, tagalongs and Dutch Cargo Bikes. We stock Raleigh bikes which are hybrids and perfect for exploring the roads and cycle paths for either long or short journeys. We also stock some spare parts and are a Raleigh Dealership so can help you with all your biking needs. You will need photo ID to book which we will take a copy of, and you will need to sign a booking form.